This 3 day event has flexible registration to accommodate more people and cover what everyone wants to learn. 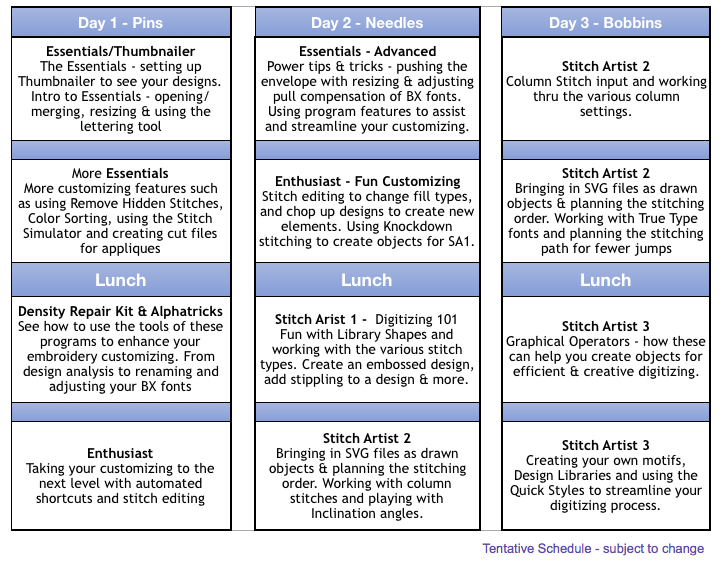 This three day schedule also provides for a single day focused on StitchArtist for those that have digitizing experience and/or are already using the program. In order to accommodate this type of schedule, we have to limit the number of people attending each day. We are referring to the schedule as Day 1 (the Pins), Day 2 (the Needles) and Day 3 (the Bobbins). So yes, you can register for Pins & Needles – isn’t that adorable! Yes, you can sign up for one day, two days or on a very limited basis all 3 days. There will be a bit of overlap and repeated information between each day so that someone who is taking Day 2 (the Needle Day) will not be lost because they did not also take Day 1 (the Pin Day). The information may be similar, just presented differently, abbreviated or in different context. 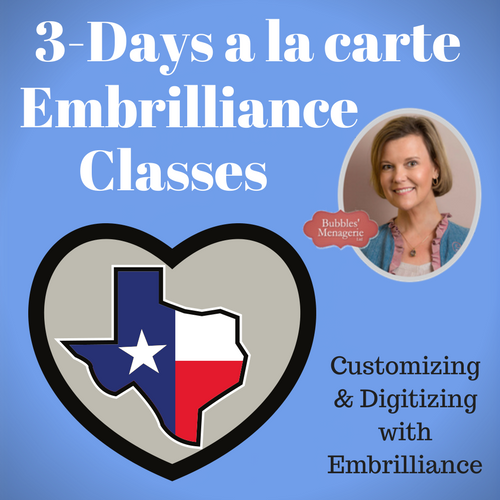 If you are brand new to Embrilliance – maybe you just got Essentials or don’t have any software yet – or you just want someone to walk you through the programs at a basic pace…..Day 1 is for you. If you find you are overwhelmed easily – you may not want to take a second day. Using the demo version for all programs is welcome on Day 1. On Day 2, we are expecting that you already have Essentials OR you are also signed up for Day 1. Just like the Embrilliance software, each Day can be taken on its own. However, because of the “more advanced” and specific nature of Day 3, we make a few assumptions: 1. that you are familiar with the user interface of the program, 2. that you have digitizing experience and/or 3. are already digitizing with StitchArtist. Ask questions before signing up! There will be a $25 per day discount if you are also staying at the hotel and booked in our group. *In order to register for Day 3 only you must already own and be familiar with SA2 or SA3 or have digitized in another software. This is subject to cancellation and a $25 fee if you register and do not meet the requirements – so please ask questions ahead of time. Click here for our cancellation policy. Please contact our travel coordinator with any questions you may have. So there you have the information on this event – YES we will have fun and learn so much! If you are not ready to register because you still have questions – Click Here! Please double check your information so that we can respond asap! If you don’t hear from us in a day or so, check your spam folder. We will reply to everyone, but if you give us a typo for your email address or have a spam filter set, you may not get our responses.